In this week of the Midwest Regional Convention of the Church of God in Anderson, Indiana, Global Strategy and Church of God Ministries are pleased to announce the appointment of Alejandro and Carmen De Francisco as missionaries to Spain, working with the Three Worlds team in Europe and the Middle East. Alejandro and Carmen will be commissioned on Tuesday, June 21, in the evening service of the regional convention in Anderson. Alejandro and Carmen are passionate about planting churches and building the kingdom of God. They will be leading the Church of God back into Spain. Together with the Three Worlds team, they have a vision to plant a network of healthy, self-sustaining, self-replicating congregations across Spain, beginning with the launch of a church plant on the south side of Madrid. Along the way, they will be raising up and training leaders for these congregations. This network of churches will be fully integrated into the fellowship of the Church of God across the region. The De Franciscos will also serve across the Europe and Middle East region as the Three Worlds team’s consultants for healthy church plants. Alejandro was born in Cuba, growing up as an atheist under Cuba’s communist regime. Carmen, born into a devout Jehovah’s Witness family, grew up as a Sandinista in Nicaragua. Their paths crossed in the 1980s when both received university scholarships to study in the Soviet Union, he for a degree in physics and mathematics and she for a degree in Russian language and literature. The couple eventually sought political asylum in Spain, where Alejandro’s father was living, later immigrating to the United States in 1991. For the next ten years they served in that church as lay leaders, growing in faith. Alejandro found enormous success as the art director of the Latin American edition of PC Magazine and later PC World. But in 2001, God brought a new calling, one that caused them to leave everything behind to plant a Hispanic church in Tampa, Florida, alongside Oak Grove Church of God. 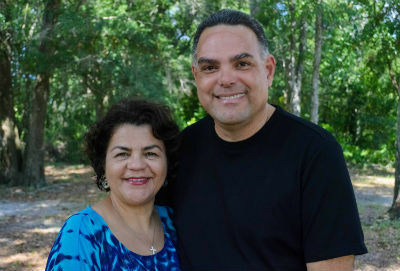 And so Alejandro and Carmen stepped out in faith into what has now been fifteen years of planting Hispanic churches throughout Florida, including ten years on staff with Florida Church of God Ministries. If you would like to support the De Franciscos’ ministry as they lead the Church of God in planting churches in Spain, you can give now online at http://chogglobal.org/living-link-donations/#defrancisco. You can also mail a check to Church of God Ministries, PO Box 2420, Anderson, IN 46018, with De Francisco, Project #42.10097 in the memo line. To learn more about the ministry of the De Franciscos and how you can support them financially and in prayer, contact Debbie Taylor at DTaylor@chog.org or 765-648-2129. This entry was posted in All Church of God, Global Strategy, Missionary Announcements and tagged 3W, Alejandro and Carmen De Francisco, Global Strategy, Missionaries, missions, Spain, Three Worlds. Bookmark the permalink.